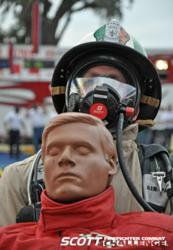 The Scott Firefighter Combat Challenge is coming to the Jackson, MS area this weekend. Firefighters from around the country will be there to compete in this physical endurance competition to promote fitness within the firefighter community. There will also be an opportunity for kids to try their hand at the Kids' Firefighter Challenge. This is a unique and great event for the entire family to come and enjoy! The Toughest Two Minutes in Sports! We are proud to announce the Scott Firefighter Combat Challenge will be coming to the area this weekend. The event is being offered to promote the physical fitness of firefighters, and will be part of the 20-plus Challenge tour to be held throughout the United States in 2012. The Scott Firefighter Combat Challenge will be held at the Jackson Convention Center, located at 105 E. Pascagoula Street. The individual competition starts Friday, June 1st at 5pm. The tandem and team relays begin Saturday, June 2nd at 9:30am. Firefighters competing in the Scott Firefighter Combat Challenge, will be competing in a five-evolution event, which includes a 5-story tower climb with high-rise pack, hose hoist, forcible entry, hose advance, and victim rescue. Competitions shall include individual, team, tandem, and relay. Firefighters will vie for times, points, and placement qualifying them for the Scott Firefighter Combat Challenge World Challenge, to be held in November 2012.